Let one of today's finest woodburning artists teach you the dynamic technique known as negative pyrography. 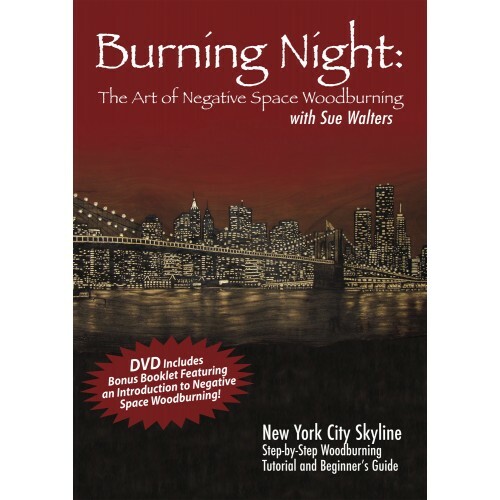 Each of the 15 lessons on this instructional DVD puts you right next to Sue Walters as she creates "Burning Night" a dramatic depiction of the New York City skyline. Instead of burning on pale wood to produce a positive image as in traditional pyrography Sue demonstrates how to engrave through burned wood to expose natural wood color. Her techniques will open your mind to new possibilities in your pyrography and craft pursuits. You can use negative pyrography to achieve contrasting light effects in designs from basic to high realism. This set also includes a bonus 24 page color booklet containing a step-by-step Day And Night Rotating Planter Box project. Sue Walters shows how to apply the principles of negative pyrography to create complementary positive and negative images, as different as night and day.